Yennai Arindhaal​ – Don’t expect another Kaakka Kaakka or Vettaiyaadu Vilaiyaadu as this is another phase of police story. A life journey of a cop where, during the journey he encounter problems and how he deals with it. Gautham Vasudev Menon​ has put his full effort to give an emotional crime drama action film. His screenplay and direction was way too good. The film had a very good scope for crime, love, action and emotions. He gave a wholesome entertaining film with the right amount of class + mass in most of the scenes. He said “Come with low expectations’. They promoted the film without creating over hype with just a teaser, posters, trailer and songs and the output was humongously outstanding. GVM seriously nailed. Furthermore, GVM joined with Sridhar Raghavan and Thiyagarajan Kumararaja to pen the storyline. Sridhar is known for his best screenplay in cop flicks while Thiyagarajan is specialised in gangster story. So, you can expect a film with the right amount of content. The film’s pace goes steady until the flashback and drops a bit during the love portions, but after that the pace just moves very fast towards the end. I do agree the film was quite lengthy but what else you can expect in a journey of a cop. The whole film was in a complete GVM style with a very strong content, perfect screenplay and storyline. It was a wholesome solid entertainer indeed. Apart from that I would say this film would be Ajith Kumar​'s best performance in his career till this date. Thanks to GVM for showing the other site of Ajith’s acting skills & transformation. He was looking smart and suave in each and every stage of his life and his acting was tremendously extraordinary being as a cop with massive action scenes and his duty to serve and protect his people, a romantic lover, lovinge and protective father to a daughter. His character was designed with a lot of emotions and he enacted them with perfection, he showed lots of variations in his body language and expressions during the course of the film and of course his screen presence is no less than terrific. Every phase in which he encountered in his life was portrayed very well. 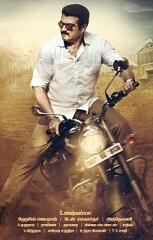 Ajith's catchy dialogues and energetic performance simply add strength to his film. Certain scenes also depict him on how he is in real life. He just rocked the show! A new deadly villain is on screen. It’s none other than Arun Vijay​ who did a remarkable job as his role was enough with negative shades to make him the fitting Villain. Be it his way of uttering dialogues, his body language as a gangster and also being a cruel guy was well extracted by GVM. He was looking handsome and smart with his new look along with a well beefed up body. Probably, the best acting in his career. Definitely a path breaking film for him! Vivek had a small role yet entertaining with good comedy timing at the parts where he was needed. As for the heroines Trisha was looking magnificent and emotes beautifully while Anushka was looking bubbly and cute. Both had good roles and they performed fantastic. Next, another backbone of the film is Harris Jayaraj​. GVM and HJ joined after 7 years and their combo smashed it again. His rocking songs and extremely terrific BGMs with pulsating dub-step, guitars on distortion and sax with the pianos in the backing, gratify every dimension of the emotions portrayed was smashingly awesome! He has proved that this combo has hit a milestone yet again. GVM could have skipped certain songs as I felt it was unnecessary which could have reduced the time duration and also kinda drops the pace of the film. What I loved in this film was the top class action and stunts. It was shot in a realistic way without any fantasy fight along with massive style. Lastly, Dan Macarthur​'s cinematography is fresh with captivating visuals and will provide a new experience to Tamil audience. On the whole, it’s a complete stylish, thrilling, emotional crime drama action film to be watched which was indeed satisfying thoroughly. Go with low expectations and it will definitely entertain you. For those who find it boring I shall give you a simple example. Take our life journey, does our life journey is filled with happiness everyday? Of course not. Our life has happiness, sadness, problems and etc. So, the same concept have been applied to this film. It is a life journey of a cop and one cant expect a racy or a fast paced film. ''My Dear Thala'' - Happy Birthday !!! Yet another dedication for Ajith from Simbu ? After Yennai Arindhaal, Arun Vijay is again at it? This page has information about , Yennai Arindhaal, Ajith.